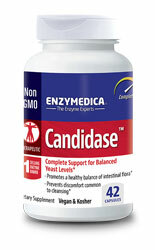 Candidase™, by Enzymedica Inc., contains two enzyme blends that support the body’s natural ability to maintain a healthy balance of intestinal flora. Cellulase breaks down the yeast cell wall while protease digests the interior proteins. This combination provides a gentle, cleansing effect without harsh discomfort common to cleansing.